The female of this breed is usually 10kg and 33cm tall, and the male is normally 15kg and 38cm in height. It is in a Beagle's nature to be a loyal companion. They are usually gentle, but they can be as robust and as tough as you care to make it. It is also a great children's playmate. In fact, the Beagle will become very ‘human’ if you forget to remind it that it is in fact a dog. 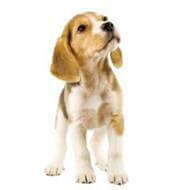 Beagles do not cope well with being on their own for long periods of time. They can be very naughty if they become bored, and dig holes, escape, or pull the washing off the clothes line.